Liked your article and pleased you resolved your shingles so readily. Just wondering did you consider St Johns Wort? I have not had shingles but it is the first herb I would consider for a patient as it is specific in fight the virus. What are your thoughts? Thankfully, I’ve never had shingles. Sounds horribly painful. I wonder if activated charcoal would have helped? Ionic silver works very well on viruses. I used it on my daughter’s very large wort (papillomavirus) on her hand. I have since found out that ionic silver also works on herpes simplex 2. Ionic silver has replaced antibiotic cream in my household first-aid kit. Great stuff! I’m sure it would Caroline. Jim uses activated charcoal in his bentonite clay internally as he mentioned in his comment. My shingles outbreak hit the sciatic nerve in my right leg. Pain pills will not touch this type of pain, but capsaicin cream will. Do not apply on blisters!!!!! but the other areas you can get some relief from the muscle pain with this arthritis aid. 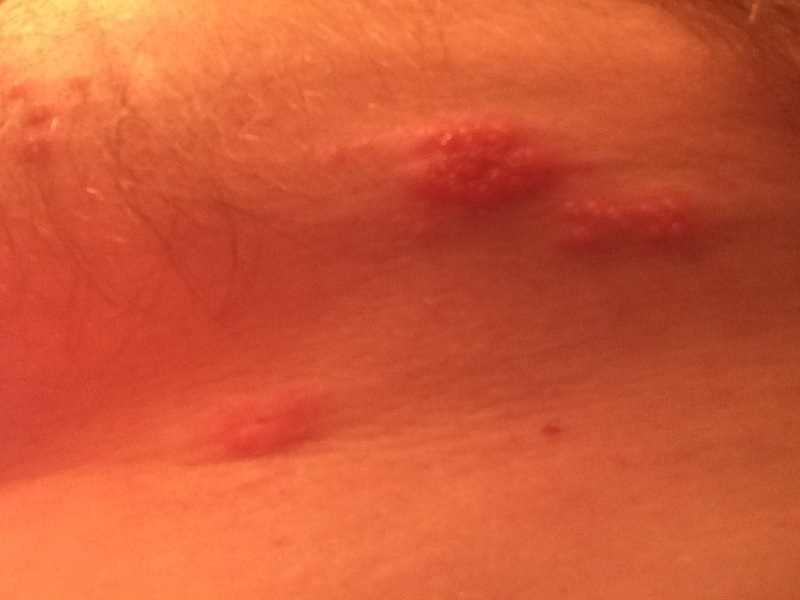 I had shingles several years ago, on my scalp, down my forehead, eyelid and cheek. I had blisters under my eyelid that scratched my cornea. I used capsaicin cream on the blisters (not near my eye) and it was a relief. Just remember that you will need to wash your hands very well, or use a rubber glove, because if you forget and rub your eye or lips, it burns like crazy. My (now) 65y/o wife had a shingles outbreak about five years ago and took some RX, along with an RX/vaccine that supposedly warded off Shingles for many future years. My wife’s shingles cleared up in a couple of weeks and she has not had another episode; but she does enjoy a lot of the L-arginine rich foods. I decided to also take the expensive vaccine ($250ish at that time) the next time I saw an M.D; and have never had shingles that I know of. I have known other Sr’s who have had it for a month or longer. I appreciate the article and everyone’s comments, since I now have on hand many of the natural ingredients mentioned by article and comments. Most of these foods to avoid apply to fever blisters(herpes I). I had a similar experience. Severe itching on the back of my right thigh – like something biting me, the first day. Then a burning sensation the next day. I suspected shingles – even though I did have the vaccine. I didn’t wait for the blisters to start – I began taking my Elderberry Tincture. Woke up on the morning of the third day, all symptoms completely gone. Did my vaccine kick in on the 3rd day, or was it the elderberry? Don’t know, but I swear by the elderberry for other viruses. Quite a few of my family members take it too, at the first sign of illness. Never heard of elderberry working. Thanks for the heads up, Jan! When I had shingles I went to an iridologist in Toronto who prescribed an herbal salve called BFC, Bone, Flesh and Cartilage, made by dr. Christopher. The salve contains comfrey root and wormwood along w other herbal ingredients. The itching and pain disappeared quickly. I also reduced meat intake and ate vegetarian diet. Shingles cleared in 3 weeks! Had phantom twinge occasionally for a year. Hi, great comments. I too developed shingles. It was about five days before I went to see a doctor as I thought it was an infection. What did I know? Doc said shingles, he offer medication which I refused two weeks later gone. All on its own. Thanks for this post Todd. I remembered seeing this post when I got shingles and referred back to it. This post was very helpful. I did get over my shingles in about two weeks. I didn’t go see a doctor. I did some research on the internet and from my home library about home treatments for shingles. The protocol I used: 3000mg L-lysine (1X daily), 1T homemade elderberry syrup (3X daily), 200mg Advil (3-4X daily), and I applied as needed homemade bird’s eye pepper salve with essential oils. I used lavender, tree tea and peppermint during the day and frankincense and tree tea in the evenings. (The peppermint essential oil kept me awake if I used it too late in the day.) The salve would temporarily stop the nerve pain. I also tried some woo woo homeopathic remedies but these are individual and wouldn’t likely help others. I had success with Bryonia 30c and Ran-B 200c. I had a bit of nerve pain after the two weeks. It would come and go but it’s now gone. Dang, I hate to hear you had shingles. Glad you found the protocol for treating yours. The bentonite clay was a huge help in drying the lesions. I want to make some elderberry syrup next year. You know we will! Maybe this summer. Hi there! I’m currently about a week in battling shingles. It’s awful! I too thought I had a rash until the blisters and went to the MD who gave me an antiviral. Did research for more remedies and I’m following a lot of what you have posted including diet, ACV, lysine and b complex. It helps to know I’m on the right track, thank you! 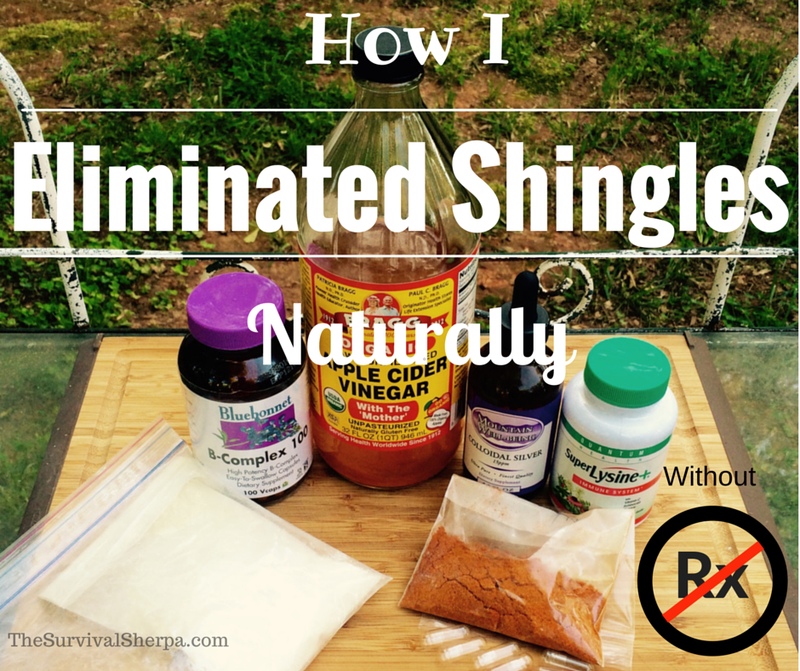 Crystal, I hate to hear you in a battle with shingles. Hope this helps in some way and you get over them soon! Growing up I had an outbreak every year around the same time in the same spot! I have tried both prescribed medicine and lysine supplements. I find that as soon as I feel the breakout if I take lysine right away it is very effective and sometimes stops the breakout all together. There has been times where I did not catch it fast enough and needed to go to the doctor for prescription medicine because the lysine didn’t work as fast as the medicine once the outbreak was full blown. But I have never used all your other recommendations which may have even better results. Thanks for sharing it was very interesting to read as someone who has been through this their whole life. So sorry to hear of your situation, Brittny. I hope the protocol helps in the future! Todd, I must have 50 of your similar posts saved in “favorites”. I always appreciate the good information, Thanks from “somewhere in South Georgia”. I read an artical years ago that said use Maalox. I have told many about using it. They came back & told me thank you because it was the only thing that cooled them. Malox was used years ago before drugs was introduced. Coat each blister with it as often us needed. Why o you say tomatoes are not good when they have a high lysine content? I got the virus and have been having crazy pain. I hope this is my only bowt with it. I am also one who prefers natural over pharmaceuticals. I chose lemon balm for a cream to help heal and started taking l-lysine. But after reading your article, I’m going your route. I always have Braggs ACV in my cupboard so I took my first shot. WHOA!!!!!!! It does take your breath away!! I also have Bentonite clay for facials and wounds. Thanks so much for this! Really helpful. 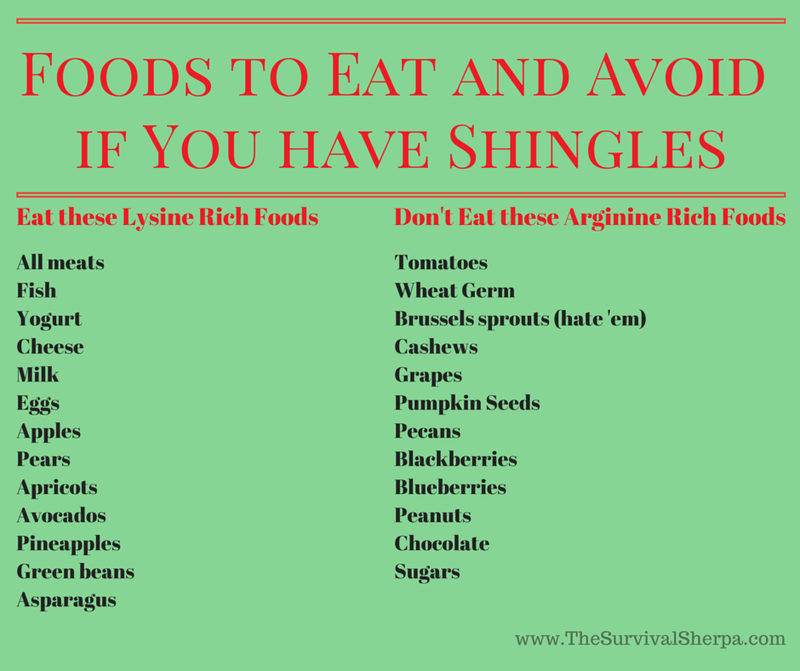 I was diagnosed with shingles on Monday and am also eating a high lysene low arganine diet. Having my usual shot of wheatgrass every morning and maringa capsules twice daily with some arnica for good measure. Yes, horse tablets too! Seems to be clearing up and the pain is less unbearable. Nasty, disgusting, foul illness…hope it never returns. Sorry to hear you came down with shingles, Marisa. What a terrible ordeal. Hope the protocol helps! Thank u for posting this!! I had a mild case of shingles pop up on the underside of my arm and it was awful because I’m going on vacation soon. I read about the clay u used and I had some here at home I bought in Death Valley…I have been using Just Bentonite clay I’m in 24 hours and 3 applications the bumps are nearly half their size and less redness and most of all they are already starting to dry up!! I noticed it was especially effectIve when I let the clay dry when I slept and in the morning i it took a lot of the pain swelling and redness away! Glad to hear the clay helped you out, Ken!